The village is very poor compared to its nearby villages since most of the villagers are labourers living hand-to-mouth without any own farm. Hence they also requested us to raise some fund for construction of a new primary school building. The following is the proposal that wasa initially senty and approved by Generosity in Action. 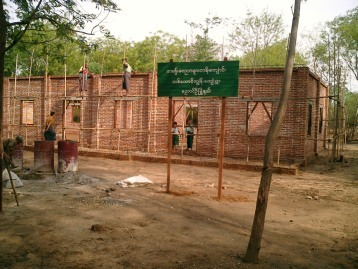 The people of Myanmar place a great value on education. And the government of the Union of Myanmar is striving to raise the enrollment of five-year olds in schools throughout the whole country. But the education outcomes are unsatisfactory. According to official estimates, three in ten five-year olds cannot enroll in kindergartens and only 40 percent of those who begin kindergarten finish the primary cycle. Although the Ministry of Education is solely responsible for providing good-quality-education-services to all children of the country, currently government's spending in education as a share of national income is among the lowest in the world. Hence, lacking of schools with enough capacity and enough teachers has come to arise in many remote areas like the proposed project area, Thit-Htaunk-Kyun Village. Obviously, it makes the whole community lower in socio-economic level accordingly. Under the current situations, as we cannot approach to enhance the standard of education nationwide, no matter how minute our role or contribution might be, we wish to contribute a little help towards the children upon their education by building up a primary school with enough capacity and enough teachers for 60 to 160 of them. It will also benefit the people in the area to achieve better socio-economic level. The proposed project area is located on the left side of the Bagan Nyaung U-Myinchan-Mandalay highway and 12 miles from Bagan City of Mandalay Division, one of the seven States and seven Divisions of Myanmar. Bagan is the most famous tourist site in Myanmar. A visit to Myanmar without visiting the Bagan Archeological Zone is regarded as one has never been to Myanmar. The Bagan area is well developed by the tourism business. Although the project area is not too far from the archeological zone, Thit-Htaunk-Kyun Village is one of the grass-root level villages where most of the people reside there are hand-to-mouth labourers engaged in the nearby farms without any of their own. The total number of households is 90 and a population of about 450 with a small dilapidated primary school and opened. The village was resettled with evacuees from the sandbar in the Irrawaddy which became awash with floods and no longer habitable. The primary school has one head master who also teaches the students and one voluntary attendance only. At the moment there are about 70 students. Therefore the student-teacher ratio of the school is greater than average. With the increase in population of the village the number of children who wish to join the school also increases but then present school building is not only old but also too small to house more school children. These villages therefore wish to bring down the old building and build a new one which can take in more school children for their education. As the villagers are general farm labourers their income is too low to be able to build a new bigger school. So they appeal to the government for construction of a new school building. The government, though willing to help cannot provide adequate fund for the new school building. The total cost estimated by the Engineer/Architect being about roughly US$ 8500 including toilet facilities and storage tank for water supply. Therefore, the villagers are compelled to look for the rest of the fund needed. The building will be a one storied building with four rooms on a land with an area of 1 acre and each room is 20'/24'. In other words the size of the building is 80'/30' with the corridor of six feet wide in front of the rooms. The number of teachers actually allotted by the government for 150 children is 3. Hopefully the number of teachers will increase to meet with the increase in the numbers of students. (1) It is one and only primary school for the education of the students in that village. (2) The villagers cannot afford to build the school by themselves. (3) Apart from the Township Education Department which is responsible for this school, there are no other donors taking interest in the construction of the school building. (4) Tourists can visit the school, its countryside environs. Please Note: Construction of the building is going to be planned and supervised by a private qualified architect and an engineer on a voluntary basis. 1. To enhance the educational standard of the children that will as well promote the education of the community in the project area. 2. To help villagers to earn extra income by participating in the construction project as general labours. 3. To improve level of socio-economic environment relating with education in the project area. 4. To make it possible for the tourists to visit the area as a tourist site of natural environs and if possible to encourage the villagers to participate in handicraft and souvenir industries which will, as a part, generate their income higher. 2. To bring down the old building. To carry out site cleaning and pre-construction works. 3. To construct a storage tank and common toilet for water and sanitation. 4. To undertake the construction works step by step as per construction schedule. 5. To make necessary school furniture and equipment. 6. As for a future plan, to build up a multi-media teaching room and a library of Primary School standard when the construction completed. 7. To appoint one or more new teacher to reduce the student teacher ratio. 8. To encourage the villagers to participate in handicraft and souvenir industries. 9. To educate the community that, after completion of the project, it is their own duty to sustain the development of the school. 1. Improved standard of education of the children in the project area. 2. Facilitated with necessary proper School Furniture and Equipment. 3. Improved socio-economic well being of the people concerned. 4. Improved handicraft and souvenir industries in the project area. 5. Can be sustained socio-economic environment relating with education due to the awareness of the community if they are being well educated. - Continuous monitoring and supervision of the project. - Assessment and evaluation of the project. - Preparation and submission of final report. See pictures of the finished project.